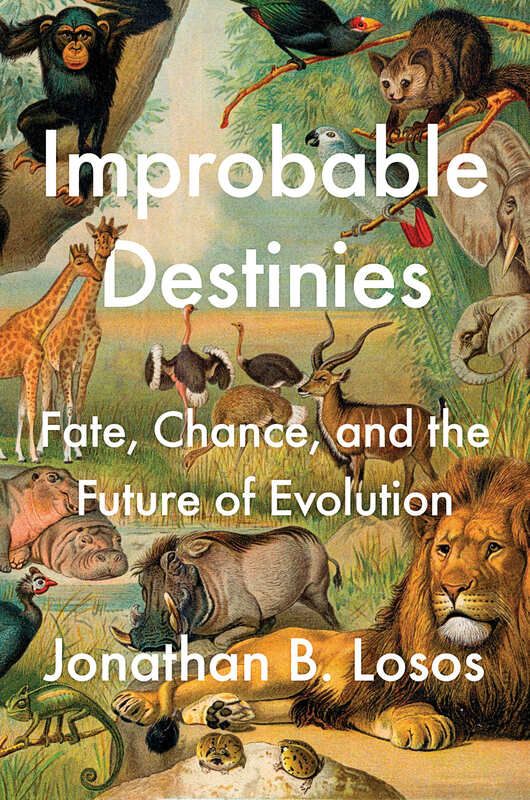 Improbable Destinies: Fate, Chance, and the Future of Evolution by Jonathan B. Losos. 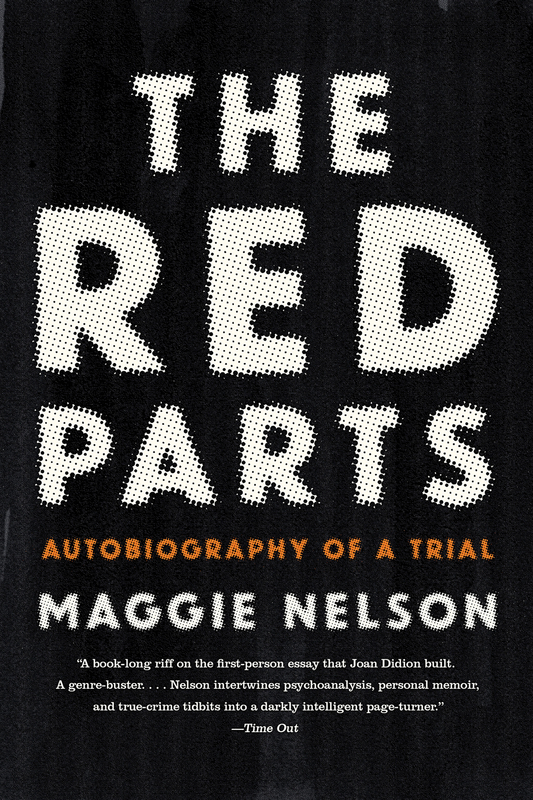 The Red Parts: Autobiography of a Trial by Maggie Nelson. Contingency is a word with two meanings that aren’t easily kept separate in our daily use, at least not for me. When we speak of making contingency plans—which we all should make regularly—it’s fairly clear we’re referring to a backup, a Plan B for what’s to be done should events go sideways, a safety valve or an off-ramp in the event that our future turns on us bearing fangs. It’s the second, though closely related, meaning that’s constantly hiding in the bushes, camouflaging itself in the mottled greens of the first one, shimmering like heat haze so as not to be noticed. Contingency, in its second sense, has more to do with the past: Event A would not have happened without D, C, and B occurring first. A is contingent on D, C, and B having filled in its past, like steps on a ladder. The American writer Maggie Nelson, whose genre-warping books have recently sent her reputation rocketing into the stratosphere—especially 2015’s The Argonauts—seems to have established herself as a new master of invoking, witnessing, and forensically studying this second sense of contingency. A new reissue of her book The Red Parts: Autobiography of a Trial serves as another reminder of the impressively rich ground Nelson has made her own. Before Nelson was born, her mother’s sister, Jane, was murdered. Nelson grew up knowing this, though she points to her Midwestern Scandinavian family’s reticence as the reason it was rarely spoken of. Fast-forward to 2004, and Nelson is about to publish a volume of poetry based on her aunt’s life and unsolved murder. A few months prior to publication, she’s contacted by a cold case detective who tells her he’s been working on this case for years—and that it’s now been solved. An arrest is imminent. crystalline, zoomed-in, cutting-edge perfection of a poet’s power with image. It is a deeply personal account of a family’s grief, a wound reopened after 35 years. There’s no pinning down what accounts for Maggie Nelson’s genius, but her capacity for living in and simultaneously witnessing extreme psychological states—all the while sounding like any one of us—must be high on any list. A fairly understandable reaction to acute inter human violence, torture, and degradation is to pull the lens back as far as it can go, back to the origins of life on this planet, and lob the futile question into the primordial muck: did we have to be here? This is one of the many beguiling questions asked by evolutionary biologists, in particular Jonathan B. Losos, in his wonderful Improbable Destinies: Fate, Chance, and the Future of Evolution. Losos, a biology professor, is director of the Losos Laboratory at Harvard University and curator of herpetology at Harvard’s Museum of Comparative Zoology. Now, if evolution and the Big Questions immediately raise the spectre of Richard Dawkins for you, be reassured—there’s no bombast and scorching declamations. Losos writes with a warm, curious, almost bumptious wonder about the natural world and how the laws of evolution act on life all over the planet. Losos is exceptionally adept at walking readers through thorny, complex concepts such as species radiation, convergent and divergent adaptation, and replicated adaptive radiation without ever losing the newcomer. This makes Improbable Destinies a wonderful, informative read both for brushing up on the basics as well as digging into what’s going on at the forefront of evolutionary biology. For instance, I did not know there are now departments, in some institutions of higher learning, of astrobiology. Let that sink in. Prior to Dawkins, the most famous evo guy writing books, columns, and just generally helping us all get up to speed was probably Stephen Jay Gould. A wonderful writer, Gould was also responsible for settling in the popular imagination—as well as the minds of many scientists—the notion that were we ever able to “wind back the tape of life” (Gould’s own thought experiment), the results would be something wildly divergent from the biosphere we now live in. Not only would the natural world be unrecognizable, there’s every reason to think we humans would never have evolved. Turns out contemporary science has something to say about this notion of contingency. In fact, as Losos makes vividly clear, there are as many reasons to believe there’s an inevitability about what evolution spits up. This is the determinist view of evolution, and there are many adherents in labs attempting to prove it so. Things haven’t come down on one side or the other definitively, but what a notion to try and assimilate: we, and everything we’ve done, were always going to happen. On the other hand, are we completely comfortable with the idea of being an evolutionary one-off? An accident? Then again, the possibility that evolution—a blind, purposeless force—should accidentally produce a life form so unremittingly destructive could be the greatest evidence against Intelligent Design. But now I’ve crawled way out on a creaky limb. Losos begins Improbable Destinies with a species of friendly lizard in the Caribbean. You should read his book and explore the wonders yourself.